Yes, you can download YouTube videos using hundreds of sites, scripts, extensions and applications and that's because YouTube's interface didn't offer a download option. Initially, the only format available for download was FLV, which was only intended to be played using Adobe Flash. Then YouTube started to test higher-quality versions for videos, including MP4 (H264 with AAC audio). Now you can export all YouTube videos as MP4 and it would be trivial for YouTube to add this option, which is already available at Google Video. 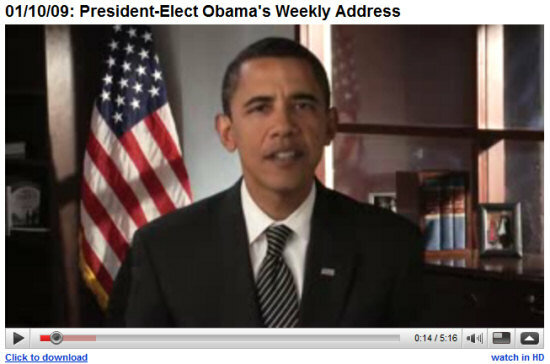 But things are starting to change: the videos from Barrack Obama's YouTube channel ChangeDotGov have a small download link below the player. "YouTube is rolling this out slowly, initially with content that aspires to be consistent with principles of open government. I'm told it will be offered more generally. In any case, it is an important development. There have always been hacks for slurping down YouTube videos. But it is a valuable step that YouTube encourages and supports this sharing," notes Lawrence Lessig, Professor of Law at Stanford University. Why would you download videos? To be able to watch them without having an Internet connection, to download them faster using download accelerators like Flashget or Free Download Manager, to use some of the content in your videos or to have an offline version just in case the video is no longer available at YouTube. So essentially you are still breaking youtube's terms of service when you download that video? Definately to have an offline version just in case the video is no longer available at YouTube. I wonder if this will support the downloading of the captions as well? Can't someone make a Greasemonkey script that looks exactly like that and copy it for all the videos? When Google video was just out I think you could download all of that content in whatever it's original form was. It was probably inevitable that they would eventually discourage use of their original product in favor the the one that was purchased for its user base. But a lot of functionality is getting lost in the translation and still find the Youtube interface to be a very haphazard design. "No stops and snags waiting for 2 minutes for the next 5 seconds to buffer... LOL ;-) "
Heck, I get that and I'm here in the states on a supposedly fast ADSL connection! I don't know why they can't set these "streaming" servers up to buffer more once a slow connection is detected. I guess the problem is that they are locked into whatever the Flash plu-in wants to do. You just need to add the video to your favourites. That way you will always find it when you need to.